Observing nature and bird watching reaches a new level with the ZEISS Victory Harpia 23-70x95 Spotting Scope. This spotting scope combines a revolutionary new optical system with a 3-stage wide angle zoom providing a constant field of view over its entire magnification period. The combination of up to 70x magnification with a 95mm objective lenses delivers easy and unobstructed views into open space. 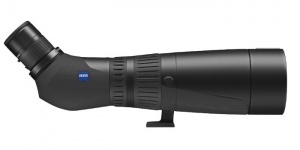 The ZEISS DualSpeed Focus facilitates quick, exact focusing, even at high magnification. Comfortable viewing due to the slim shape. Safely lockable with bayonet catch. FL glass and other custom glass ensure an absolutely sharp and colour fidelity image even at maximum magnification. Subjective 72° angle of vision over the entire zoom range for a noticeably greater overview of the terrain. Precise focussing with automatic switching between rapid and fine adjustment.